When we last left James Bond (Daniel Craig), he had just found out that the first woman he ever gave his heart to had betrayed him. You do not get James Bond to feel something and then walk all over that newfound vulnerability. You just don’t do that and, if you knew how hard it was for this particular brand of man to get there to begin with, you couldn’t do it with any good conscious. When we last left James Bond, he also reinvigorated a franchise that wasn’t in any actual serious danger of disappearing. Impressive, yes, but that is what James Bond does after all; he impresses with every fiber of his perfectly sculpted being. The trouble is there is only so high you can get and Craig’s first outing as Bond, CASINO ROYALE, was not just impressive, it made me a believer in a character that has meant very little to me over the decades. 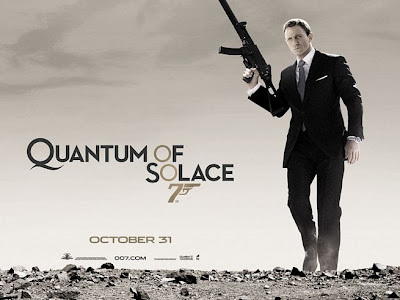 So where does the first Bond sequel, QUANTUM OF SOLACE, go from there? Not very much further it seems. Apparently, the best hands were played in the last game. I don’t mean to make it sound horrible; it’s just disappointing. 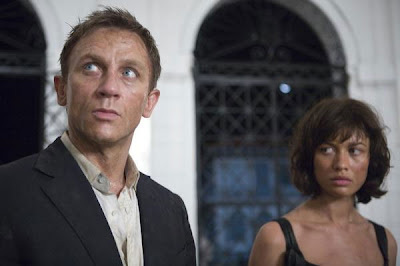 QUANTUM OF SOLACE lacks the boundless, unexpected energy of CASINO ROYALE. This isn’t for lack of trying. The action starts to move before you even have a chance to get comfortable with a high-speed car chase through the scenic Italian seaside. Then the action continues through underground tunnels, massive crowds, across rooftops, down scaffolding and through panes of glass while fighting in mid air and hanging from ropes. I didn’t say it lacked in actual action. It’s just that this particular action isn’t as exciting or original as what we’ve already seen. Sure a boat chase that plays out like bumper cars in the water – with guns! – is exhilarating but it isn’t as bracing as a two-man chase through a construction site, leading up to a fist fight 200 feet in the air on a narrow crane. Instead, every scenario Bond finds himself in seems facile and there is never any real question as to how it will play out. The caliber of stunt is much more Jason Bourne than James Bond. At one point, I half expected Matt Damon to show up running alongside him on the rooftops of Port au Prince. 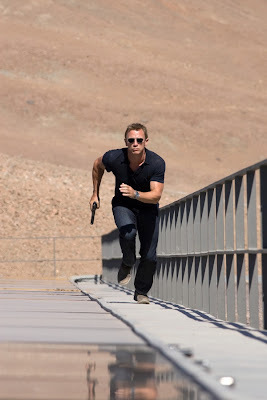 While the action is still gripping, if somewhat less original, it is the story that is most thin in QUANTUM OF SOLACE. Oscar winner, Paul Haggis, had to turn his script in before the writer’s strike began last year to make sure that production would not be delayed. The result is rushed, expectedly. Themes like trust, truth and vengeance are tossed around as concepts but never solidified as concrete dilemmas in the characters’ lives. And while one doesn’t necessarily go to a James Bond film for depth, one does expect a certain complexity to the plot. In what is the shortest Bond film ever made, Bond’s motivation is restricted to tracking down a mysterious terrorist group called Quantum. He must find out who and where they are and their eco-terrorist plot seems secondary to that. Bond must also contend with another vengeful force, Camille (a gorgeous and commanding, Olga Kurylenko), who is out to avenge her family. Could it be that she has come in to Bond’s life to show him the reality of holding on to a need for revenge for so many years? Probably but it doesn’t seem to have any effect on him at the end of the day. I have a love/hate relationship with director, Marc Forster (love FINDING NEVERLAND and STRANGER THAN FICTION, hate STAY and THE KITE RUNNER) and was certainly skeptical when I heard he was coming on to direct this 22nd Bond film. He had never done any film this size and this explosive in his career but there are teams of people around on big budget pics like this to make sure that all the action comes off as it should. Forster was brought on for his storytelling abilities. This is fine logic but there is barely any story to tell here and he can’t be faulted for having little to work with any more than the screenwriters can be faulted for having to get something in before going on strike. QUANTUM OF SOLACE certainly falls closer to the love side of my relationship with Forster than the hate side but more time needs to be taken with the next Bond – give Craig the time to do what he did first time out and show us the man behind the wheel of the Aston Martin. You can’t just grab whatever you have behind the bar and slap a martini together in no time, expecting Bond to drink it. He would simply send it back and demand you make it again. 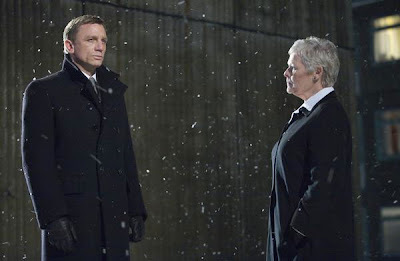 I felt very much the same way – leaving the theater saying “Yeah, I liked it,” but knowing full well it was no “Casino Royale.” With the plot tried hard to be complex, in the same breath you have spoon-fed plot devices like showing Camille’s scarred back 413 times before addressing it. The more time passes since this film was released, the less I remember about it. It was completely disposable and will be entirely forgotten by the time the next Bond hits. Shame.